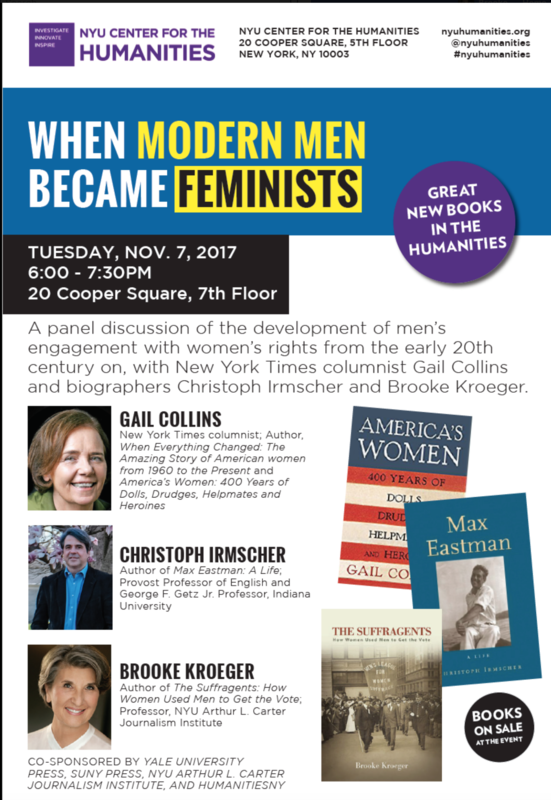 A panel discussion on November 7, 2017 at the NYU Arthur L. Carter Journalism Institute, about the development of men’s engagement with women’s rights from the early 20th century on, with New York Times columnist Gail Collins and biographers Christoph Irmscher and Brooke Kroeger. Collins is the author of When Everything Changed: The Amazing Story of American Women from 1960 to the Present and America’s Women: 400 Years of Dolls, Drudges, Helpmates and Heroines. Irmscher is Provost Professor of English and George F. Getz Jr Professor at Indiana University and the author of Max Eastman: A Life; and Kroeger is a Professor of Journalism at New York University and author of The Suffragents: How Women Used Men to Get the Vote. The event on November 7, 2017, was hosted by the NYU Center for the Humanities, 20 Cooper Square, NYC, is co-sponsored by Yale University Press, SUNY Press, the NYU Arthur L. Carter Journalism Institute and Humanities New York. For a close-up of the AV for Kroeger’s presentation, please see the additional Vimeo link below the panel video.